A big Monday episode of WLTV! 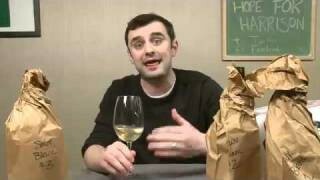 Today Gary tastes and reviews four wines because that’s what he likes to do! Tune and see how these four stack up and see if they get the Vaynernod of Vanyerclank! 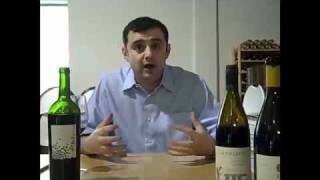 EP 13289 Point Wines. A Tasting to Settle the Score. I’m looking to buy a good case of wine for reasonable price for Christmas giveaways, any suggestions from you freaks? This chili recipe, from a friend of mine, won a chili competition held by Whole Foods. I have made it twice with very satisfying results. 1. In a large, heavy pot or Dutch oven, cook bacon over medium heat until fat is well rendered. Remove bacon. Season beef with salt and pepper and add to bacon fat in batches until all beef is well browned on all sides and set aside. 2. Meanwhile, heat olive oil in a large skillet over medium heat. Add onions and garlic, season with salt and pepper and cook, stirring occasionally, until very soft, about 15 minutes. 3. Add the onions, cumin, chile powder, chipotles, cayenne, oregano and bay leaves to the pot. Stir until onions are well-coated and fragrant, about 30-60 seconds. Slowly add the beer to the pot. With a wooden spoon, scrape the bottom of the pot. Season with salt and pepper. Raise heat and cook, stirring occasionally, until liquid is reduced by half. 4. Add the beef,beef broth and tomato sauce, lower heat to a simmer and allow to cook for two hours, uncovered. 5. Taste chili and add salt and pepper as needed. If too thick, add water. Simmer another 30 minutes, or until reduced to the thickness that you prefer. Garnish with shredded cheddar or jack cheese, chopped red onion and sour cream. 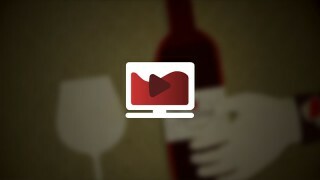 What’s with the guys who set up the Wine Library TV page, specifically the paragraph that’s under the TV screen? I’ve copied the sentence I’m referring to and used upper case for the phrase in question. QOD: I make my chili with Brisket, which I slow-braise separately in Beer and a bunch of other yummy things. The meat falls apart. I’ve braised short-ribs, pork butts, lamb confit and even duck confit for chili few times as well, for the fun of changing things up. But if you want to stick to beef chili, the brisket works out great. If you enjoy cooking and LOVE the aromas that your home fills with while your cooking, I’ll be happy to share the recipe. While everything is braising you definately have time sit down and watch a football game and drink some wine. I was pumped about the color (the way it came across when you poured it into your JETS bucket) on the Trapiche Malbec and then dissapointed that it didn’t measure up. Whatever recipe you decide, give it a lot-a-love. Trust me, you’ll taste/see the differnce a little love adds to the pot. 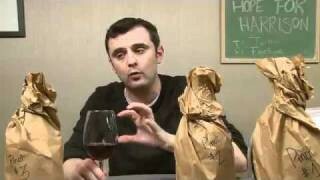 wine tastes, and that some wines that usually taste great can taste “off”. I have had those days (for instance some days wines seem more astringent tasting than others, even the same bottle. 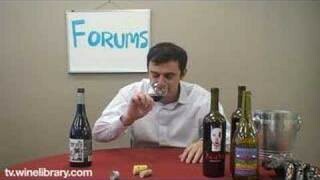 ), and wondered if as an experiment you could taste the same 4 wines on WLTV a week apart from each other and compare your impressions of the difference. You could combine them into the same episode by waiting to air the first set of wines until a week later. Of course by opening new bottles and letting them get air for the same amount of time. Maybe one on a dry day and one where its going to rain or snow.. I know it sounds bizarre.. but hey, Its WLTV and that is all about trying out different things. Gary, I love the cheese hat! 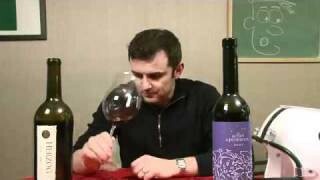 CHRIS FROM NY, buy a case of San Felipe Cabernet Sauvignon. A lot of value for 7 bones a bottle! Great show Gary. This may sound odd, but I actually appreciate when you pan wines just as much as I enjoy when you like them. It lets me know I’m not alone. 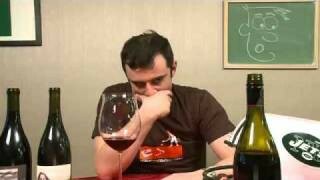 Sometimes I taste wines that other people rave about, or received a high rating, and I just don’t like it. Kudos. QOTD: I think I told you my wife is a chef, she is supposed to e-mail me a recipe that she uses. I’ve made it, but can’t remember all the ingredients. I will follow up about that one. Here’s a chicken chili recipe that I really enjoy. It goes great with a full-bodied red. 1. In a large saucepan, heat the oil over moderately low heat. Add the onion and garlic; cook until they start to soften, about 3 minutes. 2. Increase the heat to moderate and stir in the chicken strips. Cook until they are no longer pink, about 2 minutes. Stir in the chili powder, cumin, oregano, and salt. Add the jalapeÃ±os, the tomatoes with their juice, and the broth. Bring to a boil, reduce the heat, cover, and simmer for 15 minutes. 3. Uncover the saucepan and stir in the beans and black pepper. Simmer until the chili is thickened, about 15 minutes longer. Serve topped with the cilantro. Oh…thanks for the shout out about the lowly Lions. I thought we were going to pull it out against those damned Pats. Congrats on the Jets win. Even all the ESPN guys are now saying “Watch out for the Jets.” Thanks for humiliating the Packers. I consider it payback for them beating the Lions at home. We see them again in two weeks, and, hopefully the Lions will open a fresh, new, air-sealed can of whoop azz on the Cheese Heads. Looks like some great recipes here, if you have time to read ’em all. I like to cook, and some of my dishes involve fairly elaborate preparation. But sometimes its nice to cut corners and save time. I feel bad saying this, but you can whip up some pretty decent Chili using a packaged mix, Wick Fowler’s Two Alarm Chili, widely available down here in Texas (don’t know about nation-wide). Just modify by using 50% lean ground meat and 50% diced lean meat (round steak, chuck roast,..whatever). For my taste, shoot the first person who suggests adding beans! For my part, i’m o-fer in the chili dept. I’m not a fan of it. To me it comes across as a slickness on the tongue. The yeast and fermentation temps. cause this. 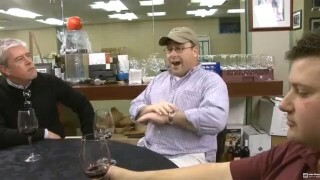 Parker gave the shiraz a 92 because HE CAN’T TASTE ANYMORE! As for Chili. No breakfast sausage, no secret ingredients. Some simple rules. DO NOT USE GROUND BEEF. Use cubed chuck (and not a better cut–uyou want a cut with some fat and some tendon in it otherwise it will be dry and uninteresting). The more different kinds of pepper you use, the better. Make sure chipotle is one of them. poblano is also good. If you are going to put beans in it (lots of debates on that) cook them from scratch. If you are thinking about using canned beans, STOP. Don’t use any beans at all. Other than that, cumin (ground), black pepper, lots of chopped onions, tomato sauce, and before serving ad some chopped cylantro. If you can use beef stock instead of water, do so. You can use beer as well or both. It should cook for about two hours and then sit at least overnight before being reheated and served. No shortcuts for my chili. I made some for New Year’s Eve and it rocked 22 guests. You wouldn’t cut corners on wine, so don’t cut them on chili. First high-fuss standard: use chunks of meat, never ground. Second high-fuss standard: grind your own spices. You want slivers of meat approximately one-quarter inch thick with the width and length of about half a square US postage stamp. Your butcher, if you have one, will be perplexed at this request. Best strategy, buy stew meat, then cut the chunks down much smaller. A sharp knife facilitates this (a dull knife is actually more dangerous than a sharp one, since it can slip). The meat (about three pounds) should not be too lean. I usually try to make at least a pound pork, with my ideal trio a pound each of pork (for the fat), beef (for the center) and buffalo (for the flavor). If pork is not on your allowed meats list make sure you’re putting in some fat from the other meats. To grind my dried chilies and spices, I use a coffee grinder I keep just for this purpose. I use a disposible face mask and disposible sanitary gloves, because I’m talking serious chilies that will give you nose bleeds. Grind together thoroughly. Store carefully. Don’t breathe in dust. New Mexico dried chilies are absolutely the best; available at Whole Foods and specialty stores. A few packages of dried chilies last years. One tip: avoid chipotles, since their smoked flavor can overpower. A nice variety of chilies will add complex fruit as well as heat. If in doubt about heat, use a light hand with the chilies, but don’t be stingy with the cumin, the real taste of chili. Never add hot sauce to chili. Once these exacting standards for the meat and chilies have been met, the rest of the process leaves a great number of options. I use a large heavy-bottom pot, in my case a cast iron Le Creuset (since I believe everyone needs a $300 pot). I dice two large onions, and sweat them in oil at moderate heat. I throw in a conservative dose of garlic a few minutes later (for me, two cloves max; garlic too early risks burning and turning bitter). I may put in diced green bell pepper, but not much, since I avoid anything that can be too watery. I will add little dollops of chicken broth as I sweat the aromatics until I get a nice caramelization: at least ten minutes. I then add enough chicken broth to wet the mixture again, carefully mix in the ground spices and chilies, salt by feel, then add the meat slivers. I mix it all up thoroughly, then LEAVE IT ALONE for several hours to simmer on low heat, adding chicken broth if it seems to risk dryness, but not with a heavy hand. Adjust salt to taste, but be careful not to over-salt as mixture concentrates. I use the not-too-salty natural broth so as not to inadvertently over-salt. Now some chili purists may say NO BEANS and NO TOMATOES. I myself will never add these. I think, however, that if you want to add them, just do it, but use quality ingredients. I also like the chili on its own, but if you want to serve it over rice or sprinkle with cheddar, that’s OK.
As to the best wine with chili, I believe it is Negra Modelo. That is, of course, a dark Mexican beer, and not a wimp beer at that. A spicy, in-your-face Shiraz may also suit, but then you wouldn’t get to drink the Negra Modelo. The goal of my recipe for chili is that it should put hair on your chest, but only if you are male. The result is opposite with females: it burns hair OFF the chest, which I believe is still a desirable result. The chili stores well, freezes well, and improves with age. I just picked up the 06 of that same Trapiche on a recommendation, I hope its better than the 04 you tasted. Gary, how about doing a nice laid back easy charbono episode? Few wineries make it I’ve had a few of them, not just the robert foley and the summer’s, the 2 best known I think. 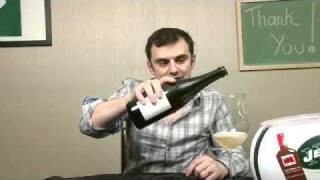 They can make pretty good wines and it would be fun to see your take on something most people haven’t had. 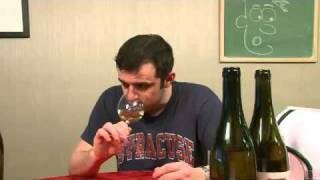 Speaking of rare wines, a vin jaune episode would really blow my hair back.